If you are contemplating going solar and have or are planning to choose MYSUN as your solarization partner, you must have noticed, that the Site Survey is the first step. In fact, we begin your solar journey by performing a site survey. Why is site survey so important? Unlike a lot of countries especially in Europe where houses are built similarly, in India, each household, each building, each rooftop is unique. It has unique designs, unique installations and therefore needs to be studied like a unique individual case. The only way to accurately know what your rooftop looks like, the neighbourhood there, the kind of objects around the area that will influence the generation is possible via a proper site survey. Your rooftop type, be it the inclination, direction or even construction material plays a very critical role when we design your solar system and the structure that would host the solar panels. Therefore our solar engineers, not just size your rooftop for details like available area and directions, they also do a thorough study of the details mentioned above to ensure the generation from your solar system is the best possible. Unless you live in complete isolation, which is highly unlikely, there is always a possibility that there are some trees, high-rise building, or other such structures around your installation areas that will cast a shadow. Moreover, the shadow pattern will change from season to season. Due to this shadow, the total sunlight received by the solar systems will be affected. Therefore a good shadow analysis of your rooftop is invaluable as it tells you the correct generation potential and therefore makes key decisions like where should you place the panels and what kind of system size you should be using. A wrong shadow analysis will leave you with an expensive solar system for 25 years that will never perform to its optimum limit. MYSUN Site survey engineers also do a thorough check and bring back crucial information like your sanctioned load, the number of phases of supply your site has and kind of consumption pattern you have. Analysis of this consumption pattern is so important when we design the system as it helps us map your usage correctly so that the benefit from solar is maximum. This would help you depend lot lesser on your DISCOM for power and save on your electricity bill. The information from the bill is also important from the point of view of Net Metering and System Design. Since MYSUN is a full-service company, we also help you obtain the Net Metering and commissioning of your Solar PV Plant. For the same, information of your electricity bill is important. We realize that even though an unused part of the house, your rooftop is crucial. At MYSUN, we handle your rooftop with utmost care. A site survey helps us analyze your rooftop and suggest a design that would make sure your rooftop can be accessible and usable. It also helps us to ensure that the aesthetics of your rooftop is maintained and how best can the installation be done accommodating if there are any existing structures there. A personal inspection during the site survey also helps us when planning the installation as to where would the various components like the inverters or batteries if applicable will be installed. What if you want to install a superstructure that would allow you to install the panels at a height allowing you to access your rooftop like normal? Or any other such requirement, we ensure that our engineers note them while conducting the site survey. This is taken care and given special consideration when the system is being designed. All your demands, instructions and requests are duly noted so that your experience of installing solar panels is as smooth as possible and everything is well documented. Why Site Survey with MYSUN? We treat every customer as an individual and special attention is given to every rooftop that we work on because we believe that a solar system is a highly personalized installation and there is no one size that fits all. So, if you had a question about, why a site survey, we hope this would have helped answer the question. 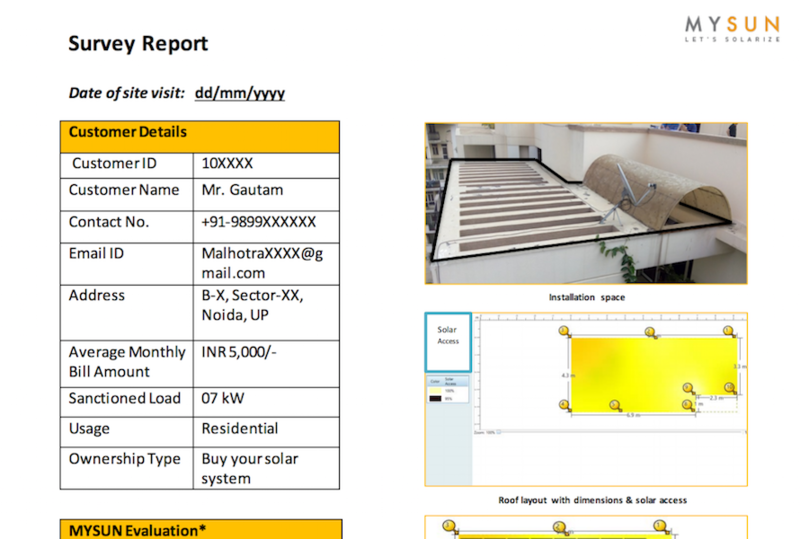 Currently, the MYSUN Site Survey Services are available in Delhi/NCR. In the regions beyond, it is the responsibility of the MYSUN partners to perform the site survey. We are expanding rapidly in the regions beyond Delhi/NCR so that we are able to serve all our consumers who are showing a keen interest in going solar. So goa head, and schedule your site survey now.